Newly-developed, high-quality 2-line CCD sensor. All New! Scan image enhancer. Digital ICE4 Advanced(TM) (Digital ICE Quad Advanced). OPTIONAL: Newly-designed slide feeder SF210 for up to 50 mounted slides. OPTIONAL: Roll film adapter SA-30 for up to 40 frames on an uncut roll of 35mm film. 35mm slides: Slides with mounts 1.0-3.2mm thick, 49-50.8mm wide; optional slide feeder SF210 can be used to scan up to 50 slides with mounts 1.5mm thick. 35mm film strips: 2-6 frames (2-40 frames with the optional roll film adapter SA-30); strips of 1-6 frames can be scanned with the optional strip film holder FH-3. MA-21, SF-210: 25.1 x 36.8mm/3,946 x 5,782 pixels/max scannable aperture = same as slide mount. SA-21, SA-30: 25.1 x 38.0mm/3,946 x 5,959 pixels/max scannable aperture = 23.4 x 36.0mm. IA-20(s): 18.6 x 28.4mm/2,915 x 4,453 pixels/max scannable aperture = 16.1 x 27.4mm. Scanning system: Fixed film, movable plane, single-pass optical. Image sensor: 3,964-pixel, two-line linear CCD image sensor. Color separation: Performed by RGB LEDs. Optical resolution: Up to 4,000 pixels per inch. A/D conversion: 16 bits per color. Output: Full color or gray scale at 8 or 16 bits per channel. Focus: Auto and manual; auto focusing point selectable. Power requirements: AC 100-240V, 50/60Hz. Operating environment: Temperature 50-95°F (10-35°C), relative humidity 20-60%. Dimensions: 3.8 x 6.8 x 12.4 in. (96 x 172 x 315mm) (W x H x D). * Scan: 20 seconds (time to complete preview or scan when no options are selected). CPU: Pentium® 300 MHz or faster. OS: Windows® 98SE, Windows® Me, Windows® 2000 Professional, Windows® XP Home Edition, Windows® XP Professional pre-installed model. * RAM: 128MB or more (512MB, or more, recommended). ** Hard disk: 40MB required for installation (200MB is recommended), with an additional 200MB of free disk space available while Nikon Scan is running. Display: 800x600 with 16-bit color (full color recommended). Interface: *** USB: Built-in USB 1.1 ports, USB 2.0. Others: CD-ROM drive required for installation. CPU: Power PC G3 or later (G4 or later recommended). OS: Mac®OS 9 (9.1 or later), Mac®OS X (10.1.5 or later). * RAM: Mac®OS 9: 64MB or more (256MB or more is recommended), Mac®OS X: 128MB or more (512MB or more is recommended). ** Hard disk: 70MB required for installation (200MB is recommended) with an additional 200MB (Mac®OS 9) or 550MB (Mac®OS X) of free disk space while Nikon Scan is running. Display: 800 x 600 with 16-bit color (full color recommended). * Note: More memory may be required depending on film type, scan size, resolution, bit depth, the number of scans performed in each session, the film holder or adapter used and whether Digital ROC or Digital GEM are used. A system with more than the minimum amount of memory is recommended. ** Note: Additional free disk space may be required depending on the film type and number of frames. 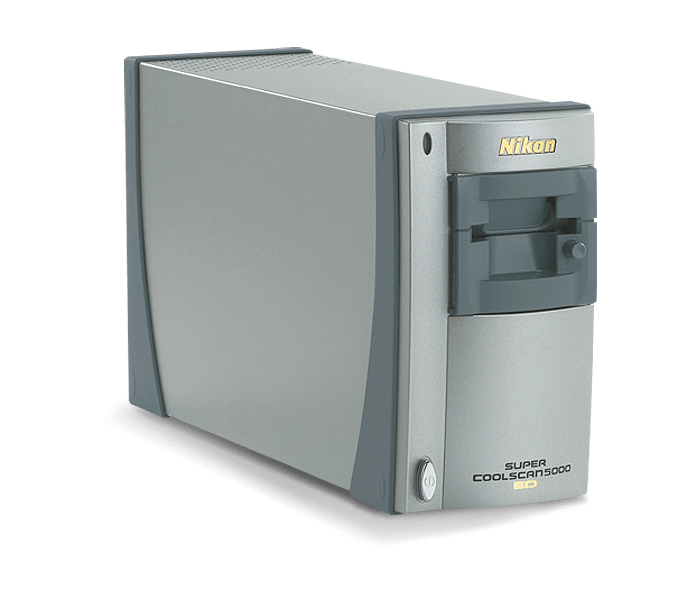 Nikon recommends having as much free disk space as possible when running Nikon Scan. *** Note: Depending on the type of interface installed, USB will operate at high speed (USB 2.0 only; maximum transfer rate 480Mbps) or full speed (USB 1.1/USB 2.0; maximum transfer rate 12Mbps). Computers running Windows®XP and Windows®2000 Professional with a USB 2.0 interface support high-speed USB. For more information, consult the manufacturer. Users of Windows®XP, Windows®2000 Professional or Mac®OS X whose computer is not equipped with USB 2.0 can install a RATOC PCU3U USB 2.0 interface board (for more information, visit RATOC Systems Web site). Additional information: Scanning times and other performance-related statistics are based on Nikon internal testing results.